Ensuring your marketing strategy is working as effectively as possible is a big challenge. As the company gets larger, the complications make things more difficult. So how do you build a marketing strategy that works for an enterprise? Being an enterprise marketer has its own unique set of challenges. Marketers working within larger companies may be constrained by procedures and structures, which can stifle innovation and creativity. They are also often forced to compete with other departments for resources, and need to produce evidence to back up their strategies within strict timelines and reporting procedures. Whatever the size of your company, a strong marketing strategy is critical to build your customer base, drive sales and revenue and ultimately achieve business goals. Enterprise marketing applies many of the same concepts as marketing for smaller operations, but within the context of a more nuanced environment. Building a strong enterprise marketing strategy involves optimizing key elements, such as SEO and content marketing to position the company as a leader in its sector, while delivering strong, demonstrable results. In this article we will look at the tactics and techniques to make the most of these and other essential pieces of your enterprise marketing strategy in 2019. Your goals and objectives must be the first step in developing your strategy. As tempting as it can be to get caught up in tactics, you simply can’t work out what you’re doing if you don’t first define where you want to go. A strong, documented strategy is also not only advisable, but often a requirement imposed on enterprise marketers. Goals are the broad, desired end points, such as building your customer base, or increasing revenue. Objectives, on the other hand, are smaller, actionable chunks which fall under each goal. Objectives are usually quantifiable, such as gaining a certain number of social media followers, or attracting a specific number of sales leads. A struggle for enterprise marketers may be to work within the goals set by the company: it could be that the goals are handed down to you, and it is up to you to define the objectives. Or you may be assigned both. Whatever the case, be sure that objectives are appropriate and sit well under each goal, and all are not only achievable but optimal. If not, it may be time to challenge management and send them back to the drawing board. Your next step is to clearly define your target audience. This is essentially the same as your target market: who are you trying to sell your products to? Who is your ideal customer? This ideal customer should likewise be the focus of your marketing efforts, and your tactics should be tailored to reach this person and convince them to buy your product. Some brands and marketers create an “avatar” or a fictional character who serves as an example of this ideal customer. Creating this avatar can be highly useful in identifying how to best reach this person, by defining what forms of media they use and at what times of the day. It can also help you to determine the messaging and copy which will be most effective in engaging this ideal customer and converting them. This specific, targeted approach is much more effective than a “scatter gun” approach which simply tries to reach as many people as possible without knowing who you are talking to. Depending on your product and your business, you may have multiple market sectors, and multiple ideal customers who you’re targeting. In this case, it’s important to define each of these, and adapt your strategy accordingly. You may have different, specific strategies for targeting these different segments. You may also wish to adapt your definition of your ideal customer as your business grows and you collect data about the people who are actually buying your products. Before you can begin to execute any kind of marketing, you also need to be clear on your message. Your messaging needs to be prominent and consistent throughout all of your marketing elements, from each social media post, to every email and digital flyer. If you messaging has become confused, start from the beginning by developing your brand values: your company’s core beliefs and guiding principles. What is your company’s point of difference to its competitors? What are your strengths? How do you wish to apply them? What are your target markets’ needs, in particular any needs which are not currently being met? Your messaging should then follow logically as a result of your goals, your target audience and your brand values. Once you have defined your message, make sure it is clearly communicated to everyone in your organization. A style or branding guide can help to ensure that messaging remains consistent across all parts of the organization. In today’s search engine-centered world, SEO is more important than ever. It’s also arguably even more important for new enterprises seeking to grow and develop their customer base. However, it remains largely under-utilized and misunderstood by the majority of businesses who don’t understand that SEO goes far beyond just keywords (though these are, of course, important). Links and citations: Along with relevance, one of the main features Google looks for when ranking sites is credibility. Having as many links as possible from well-known, authoritative sites to your domain tells Google that your site is reputable and means it’s more likely to rank it highly on results pages. To aid this, you can conduct a link-building campaign with the help of digital PR. Comprehensive keyword research: Keywords, as mentioned, are not the only factor in SEO but they are important. Keywords are what tell Google your site is relevant to a user’s search. Therefore by using and implementing the correct keywords, you can make sure your site is visible in more, and importantly relevant, search results. Use competitor analysis and tools such as Ahrefs or SEMRush to see which keywords your competitors are ranking for. Keyword placement: How you use your keywords is almost as important as the words themselves. Keywords should be included in certain places on pages and posts in order to be most effective: specifically the page/post (H1) title, the SEO title, and the permalink (page URL). Other places you should be sure to include keywords are in the first paragraph of the post, the subheadings, and image alt-tags. Technical SEO: How your site performs is also critical when it comes to SEO. For example, Google is more likely to rank sites with faster page loading speeds. Other technical elements which are important for SEO include site maps, internal links and WordPress themes (some being more SEO-friendly than others). Not to mention, these elements are also important for customer conversions. In 2018, the importance of content was widely recognized, with countless businesses, from start-ups and SMEs to some of the world’s biggest brands, adopting or stepping up their content marketing strategies. This trend is set to continue in 2019, as companies recognize how effective content can be in building their reputation, increasing their customer base, and bringing in more revenue. As the content marketing landscape gets ever more competitive, it’s more important than ever to execute your content well. 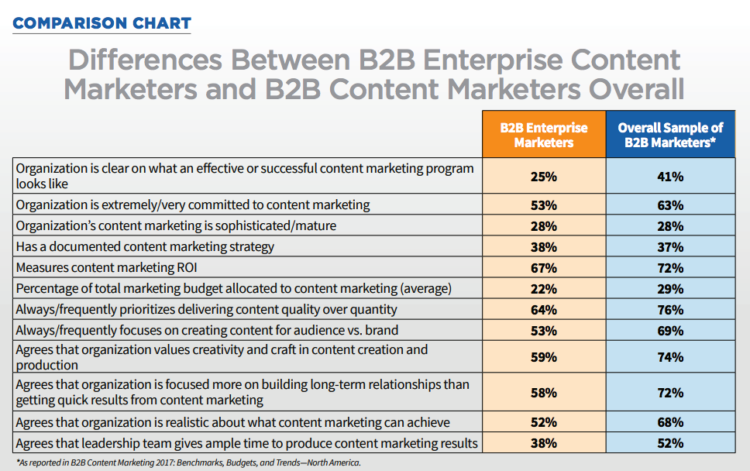 Enterprise organizations face particular challenges when it comes to creating quality content which will help them meet their business goals. There may be issues around effective collaboration between departments which make creating quality content difficult. In other cases, a lack of a dedicated content marketing team may mean content creation falls to subject-matter experts alone, who struggle to produce engaging content. The solution may be to invest more in content marketing tools and expertise in-house, or to outsource content creation to external agencies. Enterprises should also be aware of the opportunities which may be available to them. Often, for emerging sectors at the cutting edge of new ideas, tools and terminology, content is a great way to help your audience understand these developments, while building relationships at the same time. For any strategy to be successful in achieving its goals, it needs to be flexible and adaptable: as the strategy rolls out, approaches and tactics may need to be adapted to changing circumstances, or you may simply find that your techniques don’t yield the desired results and therefore need to be changed. Being able to make these changes relies on a comprehensive and well-implemented system for assessing performance and measuring results. As part of developing your strategy, be sure to set specific goals and objectives which have measurable targets wherever possible. This will mean that you can easily assess the success (or failure) of your strategy as it progresses. These processes also serve another purpose when running a marketing strategy at an enterprise level. They’ll provide you with firm figures and measurable results to report back to management, the board and/or shareholders to demonstrate the success of your marketing efforts. This will also help you to petition for more resources for the marketing department, in a context where funding and resources are always hotly contested. Set up structures for assessing the performance of your strategy. This may be weekly or monthly measurements, with a set process for changing and adapting the strategy accordingly. Make use of online tools and software to audit certain processes and KPIs. For example, Google Analytics has a range of tools for auditing site traffic and performance. Author: Tom Buckland is a digital marketing and Amazon seller consultant specializing in technical SEO and link building. He’s the founder of Ghost Marketing and is an Amazon SEO Consultant in the UK who loves helping businesses profit through smart digital marketing strategies.